Major announcements were made by the Canadian Immigration Minister Honourable John McCallum on December 7, 2016 regarding sponsorship of spouses to settle as a permanent resident of Canada. 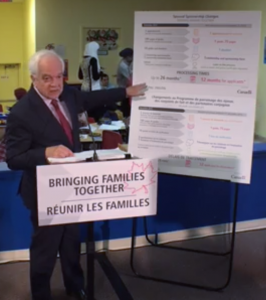 Mr. McCallum used a day care centre as backdrop to emphasize the importance of family reunification (see image with this article from official Facebook feed). The revised spousal sponsorship system is to start on December 15th, 2016. The Minister stated that processing times will be cut in half for spousal sponsorships from inside Canada, down from 24 months to 12 months. He also said the application system would be streamlined. There will be one overall sponsorship kit, regardless of whether the application is for a spouse inside or outside of Canada. The number of forms to fill will be reduced, and the online guide will be shortened, using “simpler” language, according to the Minister. Applicants will no longer have to submit police and medical reports at beginning of process, but only later, when requested by officials. Despite the promised reduction in processing delays, Canada will remain vigilant in monitoring sponsorship applications for fraudulent relationships, as well as for criminality and background checks, Mr. McCallum stated. We at Fogarty Law Firm welcome these changes. We are ready to assist you through the sponsorship process so your spouse may settle legally as a permanent resident of Canada under the new system. You are welcome to reach out to us to get started here.